Godt NytÅr means Happy New Year in Danish. Apparently, it sounds like I’m saying “Got Noodle” when I try to wish people a Happy New Year in Danish. 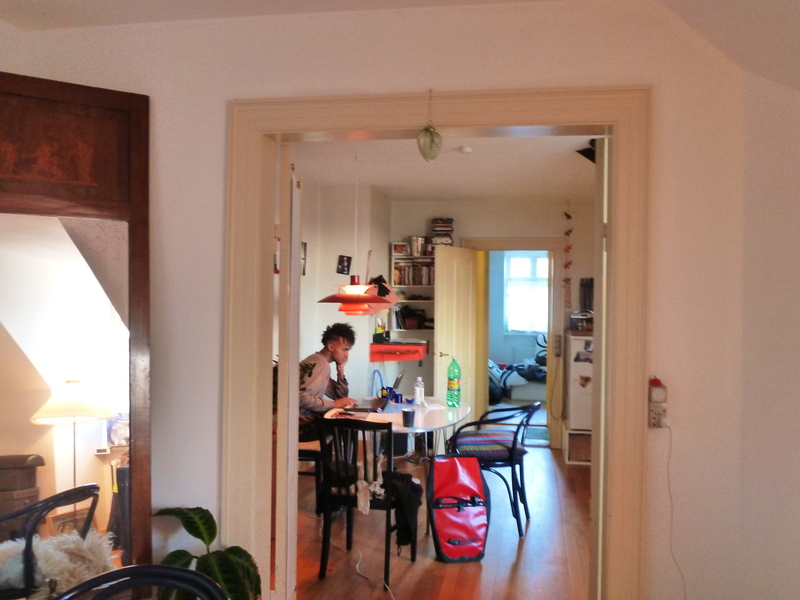 I arrived in Copenhagen on December 30th at 7:30 AM. It was pitch black outside and only by about 8:30 AM did the sun begin to rise. The sun starts to set at about 3:45 PM. It’s dark a lot. 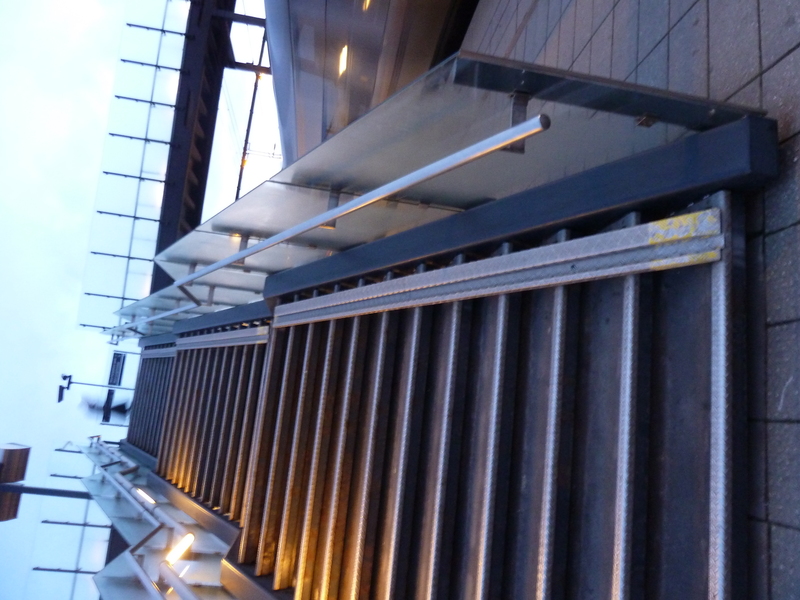 There are bike ramps on the stairs to the Metro station platform and entire Metro cars are dedicated to bikes. I got up the station stairs and–boom–there were about 1,000 bikes parked at the Metro bike parking station. I walked about 20 minutes to the apartment I’m staying at and watched the bundled up morning commuters fill the cycle tracks. The sun was still coming up at that point and all the little cafes had candles lit at every table–seemingly an effort to make things feel a little cheerier despite the 17 hours of darkness. 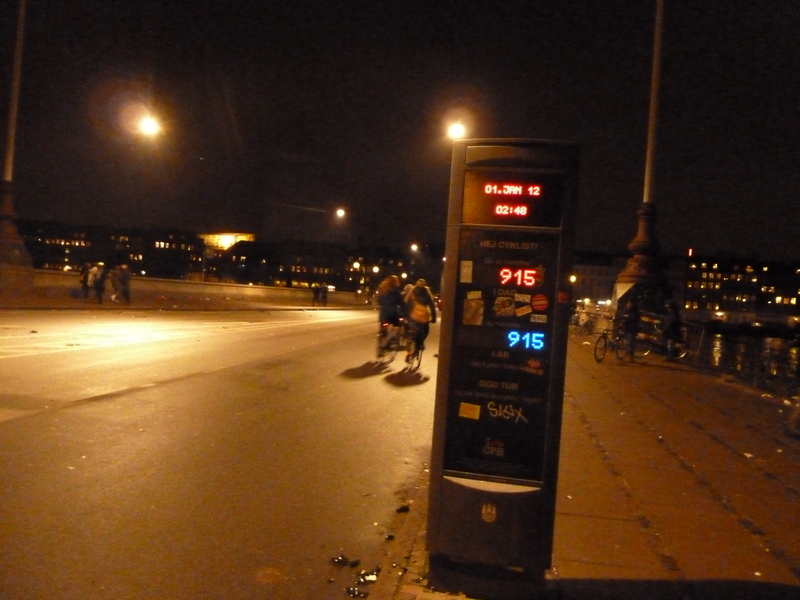 The bridge that I’m living next to has a bike counter on it and as of December 30th more than 4 million cyclists had crossed that bridge in 2011. This is an impressive figure because there are only about 1.1 million people in the entire Copenhagen urban area–and this is just one of many bridges. I left Bertha at home and picked up a used bike just a few hours after I arrived. I’m living in the Nørrebrogade neighborhood which the Copenhagen tourist map calls the “multi-ethic neighborhood.” I like it. It seems to be comprised of East African, Middle Eastern, and Indian immigrants–and plenty of ethnic Danes. I went to a bike shop about a block from my apartment and tried out a few different bikes. The shop owner asked me where I was from and I told him. I asked him where he was from and he said Iraq. He didn’t seem to have any problem with me being an American, but for some reason I felt compelled to tell him that I opposed the war. (By, “opposed the war,” I mean I bought an anti-war sticker and put it on a notebook during my first year of college.) “We are partners!” he laughed. “You need our oil!” He gave me a discount on the bike and promised me I could sell it back to him when I left Copenhagen. He was really nice. I’m living with a 25-year old theater student named Mohammed. He has a Euro mohawk and looks like he could be on the cover of GQ. He’s currently reading Brad Pitt’s Rise to Stardom and I have already come home once while he was–quite passionately–practicing his lines for his next play. Mohammed and I made New Year’s dinner together and then got ready to go out. I put on jeans, a “going out” shirt, and mascara. He took one look at me and then explained nicely that girls really dress up in Copenhagen. “So, I should change?” I asked. “Yes,” he said. I put a dress on and then waited 45 minutes while Mohammed tried on every possible dress shirt-blazer combination he could. Finally, we got on our bikes and headed to the party. While we were biking I noticed that men we’re wearing tuxedos and women had on skimpy black dresses–I was glad I changed. The party consisted of several of Mohammed’s friends who are girls. We all drank cava and talked about our feelings for a little while. Then we danced to ABBA. Right before midnight we turned the TV on and watched Dinner for One. It’s a short comedy sketch–with kind of a dirty ending–that is watched by millions of people across Scandinavia and some of Germany on New Year’s Eve right before midnight. It kills time while you’re waiting for the countdown I guess. It’s kind of funny, especially if you’ve had some cava. Right before midnight we all took our shoes off, stood on the bed, counted down to midnight, and then jumped off the bed into the New Year. Then, we got on our bikes and made a mad dash to the rich neighborhoods where all the good fireworks are. 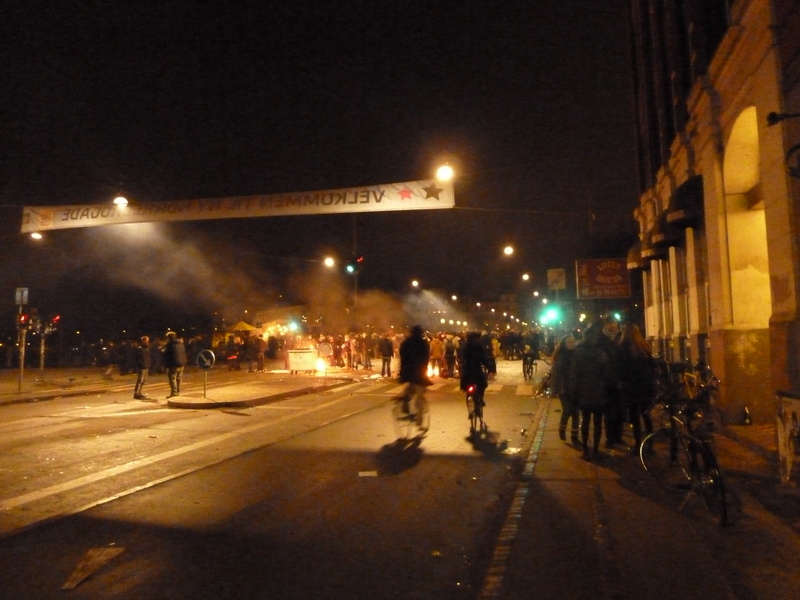 Citizens put on the fireworks shows in Copenhagen; it’s a little scary, actually. We ended up watching fireworks from the bridge near our apartment–there was a DJ playing music on the bridge and the road was closed off to traffic. 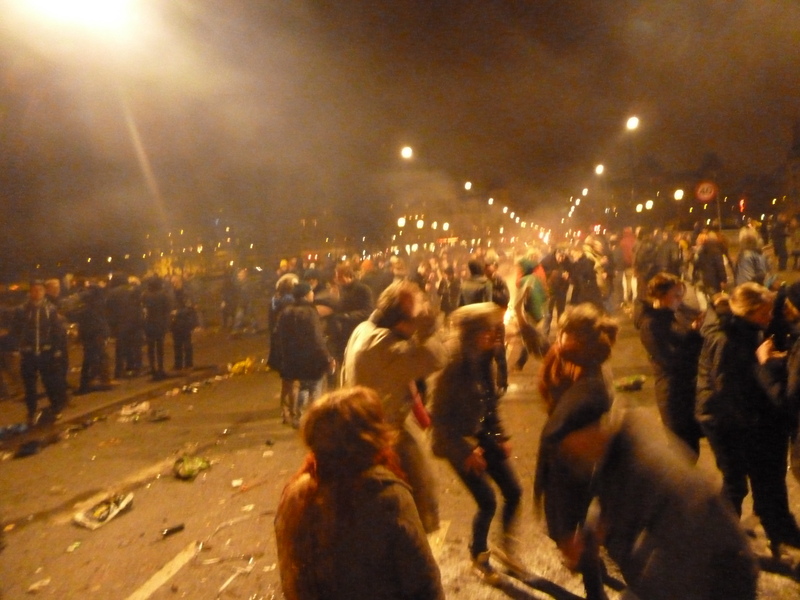 I’ve never seen so many people dancing in my life–not to mention that people had started fires on the bridge to stay warm and they were lighting fireworks off from the bridge. It would have been a great location for a low budget filmmaker to do a WWII battle scene. Mohammed headed off at around 3 AM for another party and I headed home because 3 AM seemed really late. 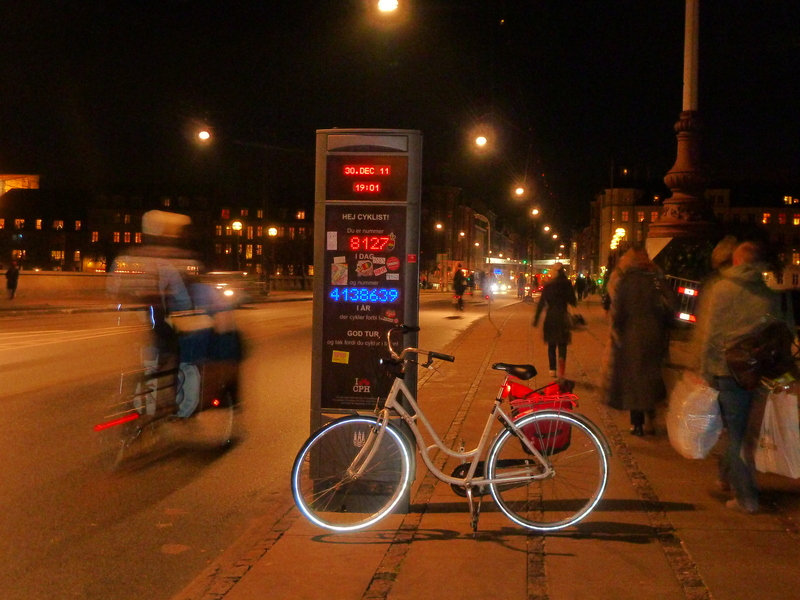 Just 3 hours into the New Year almost 1,000 people had already biked across the Dronning Louise Bridge. It was an exciting start to 2012! 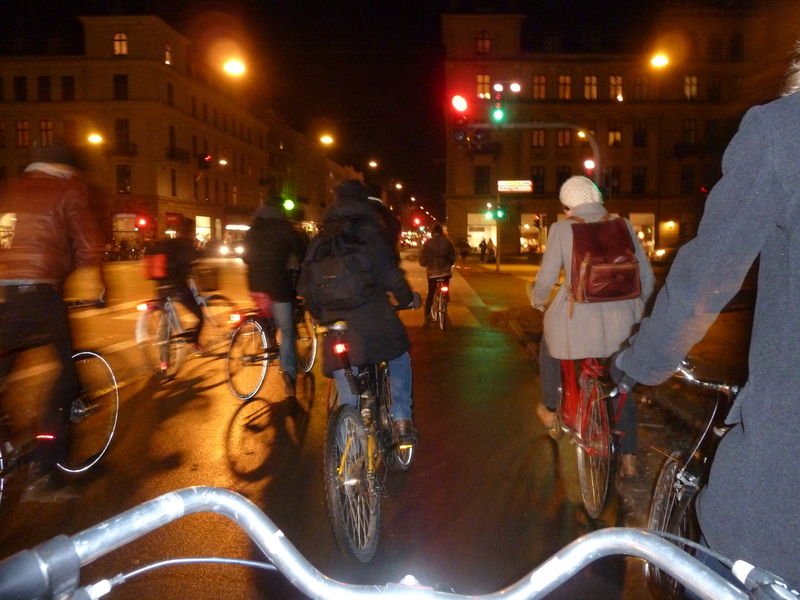 Today was my first day at Copenhagenize and I learned about all the current projects they’re working on. 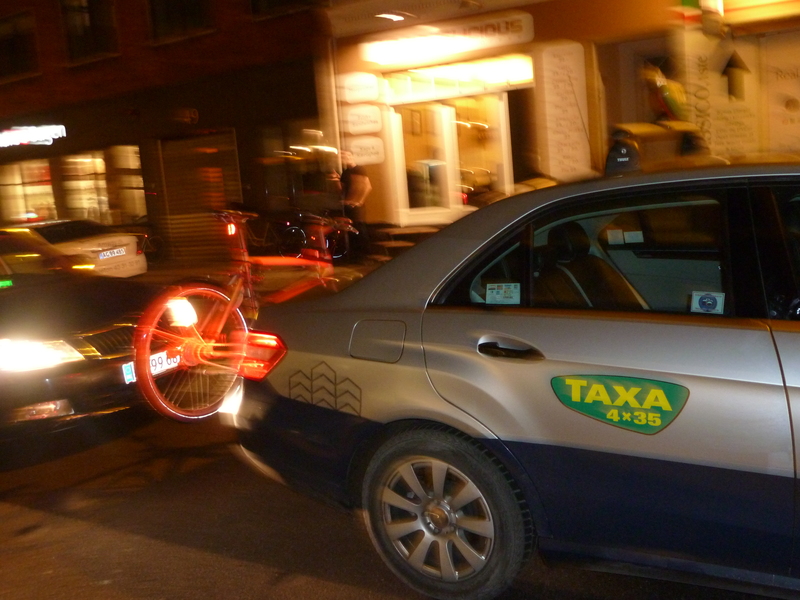 They’re staying busy working on everything from commercial cargo bike demonstration projects in cities throughout the EU to research about effective cycling promotion funded by the Danish Transportation Department. 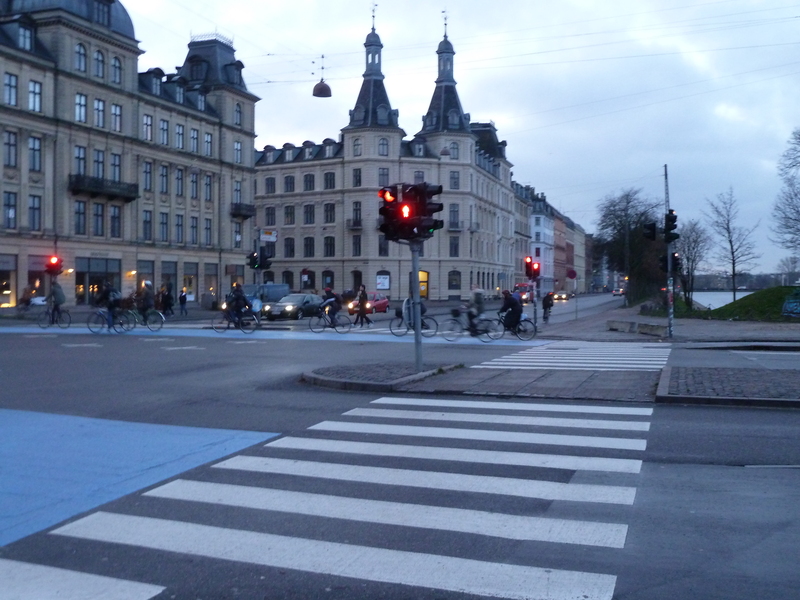 My first project is going to involve analyzing film footage from an intersection in Copenhagen to understand how cyclist’s behavior changes depending on infrastructure design. Essentially, the hypothesis is that bad infrastructure makes bad cyclists (i.e., cyclists don’t break laws if the road infrastructure is designed with cyclists in mind). We’ll see what I find. Bike ramp at Metro station. Testing out my new bike. Over 4 million bike trips across this bridge in 2011. Also, that is my bike. 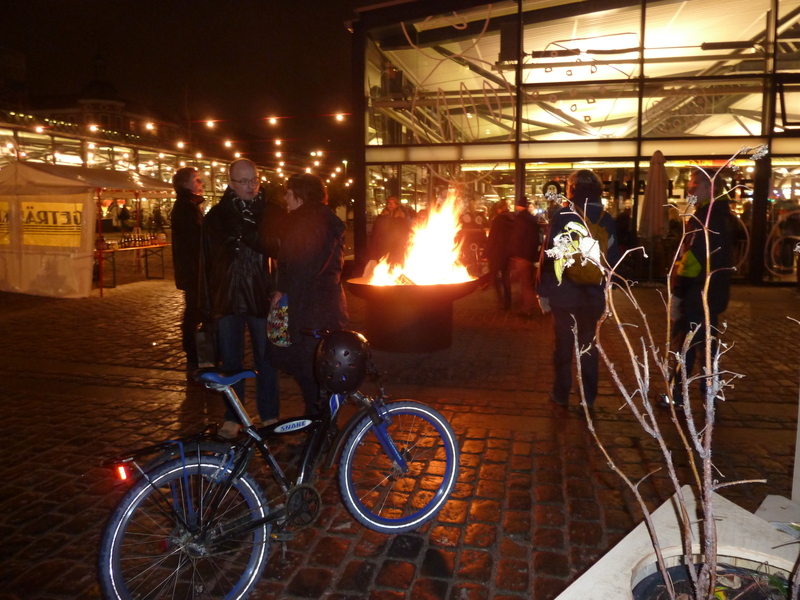 The new farmer's market in CPH. I've seen quite a few outdoor fire pits. 915 trips by bike across this bridge during the first 3 hours of 2012!